My friend, William Chamberlain's take on the same topic - here. I am a public school teacher. These two aren't supposed to mix. I'm not supposed to talk about my faith with students. 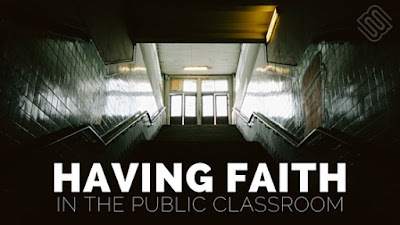 What I can do is show my faith through my actions, hoping that students, parents, and fellow teachers question those actions and wonder what makes me different. Disclaimer: I can be very un-Christlike. I'm not perfect. I raise my voice, yell, and get upset. I don't forgive all the time. I probably don't see as much potential as I should. I don't show as much love as I need to. I'm harsh at times. I'm spiteful at times. I show favoritism to the students who do their work and are nicer. I'm not nice all the time. I don't treat everyone how I want to be treated. I have hurt others with my words. I'm not perfect and don't pretend that I am. Sometimes, I think that when others hear that you are a Christian, they give you a "holier-than-thou" vibe and then chastise you because you screw up. I'm here to tell you that I screw up a lot. I struggle with my faith on a daily basis. I also get an audience of 135 students every day to help me in my faith - even if they don't know they are helping me. Just know that because I say that I am a follower of Jesus, doesn't mean I am perfect. I am still human. My faith is personal to me. I'm not one to share it outwardly. I hold a lot of things in. I may seem outwardly jubilant and very outgoing at times, but at my core, I am very introverted. I teach social studies. I'll teach about all the major religions and also Greek and Roman Mythology. I don't force feed my religion on any student. I struggled with writing this post because it's hard to write about something that you're not supposed to talk about, so I decided to leave it to some who are mightier with the pen. (Although, I think just reading lyrics is very spiritual.) These are songs that mean something to me. They help me to relate to the classroom. Also, my favorite bands are Crowder and Rend Collective. When I Need Reminded That It's Not About Me And How I Don't Need Inheritance Or Extra Stuff Because I'm A Teacher. When I'm Sad Because One of My Students is Going Through Something Rough. When I Forget My Purpose and Need A Slap In The Face Because My Actions Don't Reflect Jesus. When I'm At A Loss For Words And Need A Shoulder To Cry On Because Things Are Out Of My Control. When You Decide To Follow God's Calling into Education. What I Picture My Classroom As. A Family. Togetherness and Celebration. Choosing Joy. There When You're Down and Celebrating When You're Up. A Real Community. I found this earlier this week and I thought that it spoke exactly to what I wanted to say and sums this post up perfectly. No matter what your job is, you can take out football and put yours there. Keep building the kingdom. It is here. It is near. Show others. Well said and amen!!! This public school teacher can relate! Thank you! Matt--Thanks for this post! I am a public school educator but still need to put Christ first. I feel your struggles! Just being who you are and doing the best you can everyday will be a great witness to those you come in contact with.